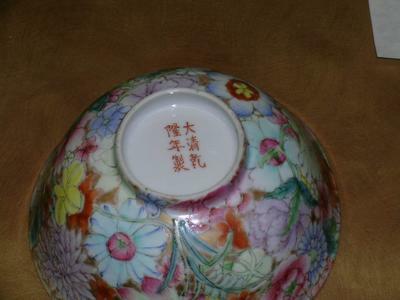 I have one thousand flower dishes my grandfather bought for my grandmother when they lived in Shanghai and I have tried to find out more about the dishes. I have a lot of memories with these dishes and remember using them on the holidays. I know they were handmade and painted porcelain from china in the early 1900's. Does anyone know the value of these dishes or where I might be able to obtain some of the pieces that have been broken? I appreciate any information that is shared with me. Thank you for taking the time to look at the pictures I have included. I have a very nice collection of these plates. How many do you have? 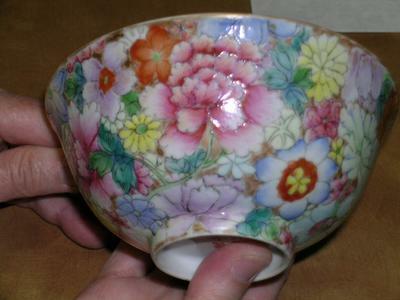 If you do an image search using either "Chinese millefiori porcelain" or "mille fleur porcelain" you should find many similar items. Yours has a spurious Qianlong reign mark, but could have been made in the early 20th century. You might be able to find some replacement items, but usually it is difficult to find an exact match, as they will be from different batches.